Well, I'd like to have ALL of these, but for now, I'm the owner of #1. Aren't they beautiful, though? These rings are handcrafted by Jen of The Nautical Wheeler. 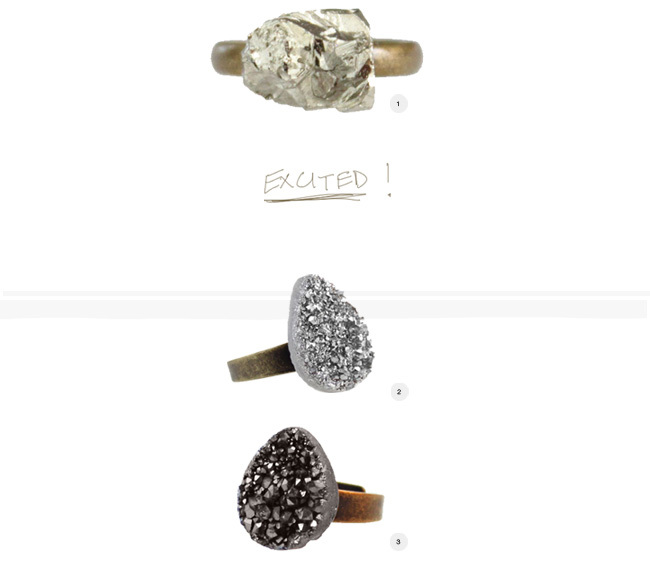 My mouth dropped a little bit when I saw the Druzy rings posted on her blog, and when I saw the metallic little beauty, I broke down and decided it was meant to be. I'm usually not that much of a ring wearer (except for my wedding ring), but these are too pretty to pass up. The Druzy rings are under $40, and my little baby was under $20. Umm...whoa??! I've been in love with her stone necklaces for a good long while, also. That option B is killing me. If you like the kind of earthy, simplistic style but don't feel like spending 19874973 dollars, get yourself over to her shop! If you don't sprint, I'll probably buy it all before you have the chance to blink. Sorry in advance. oooh I'm jealous of your new ring! I like the middle one best, but mostly because I have a necklace that would match it!!! So pretty! I love the first and the third. They're so glamorous and natural. So gorgeous! I love the first one, so simple, natural, and classic! Great choices. OK, that ring is gorgeous...and I can't believe the price...going over to check it out now. Under $20!? I had to read that three times... I feel sure you've left a zero off! It's gorgeous and am heading there to check out the rest of her stuff! Thanks for stopping by and for your lovely comments. Am so glad to have found your fabulous blog - am following and look forward to reading more! Those are beautiful. Seriously. I love rings but I like to be able to wear them all the time (as in when I go to bed and in the shower). Are they sterling silver? Thank for becoming my follower and for you comment!!!!! ooo, so want that ring, it's fabulous!! envious over here! These are so gorgeous! I'm definitely going to check out her shop...I do love that these aren't ridiculously expensive! thanks for the visit! nice blog! Hi! I found you via Melissa Blake's blog. I LOVE these rings... and they're so affordable! Thanks for sharing. I'm following your lovely blog now. xo. Thanks, loves! I can't get over these pretty little rings! I'm wearing mine right now! She really is such a good seller, and her shipping is RIDICULOUSLY fast! Wren: Ahh, that's how I am with my wedding ring. I think you have to be more careful with these, though. The one I have is on a brass band, so I don't think it can be in the water. You should definitely get in touch with Jen, though, via Etsy conversation or her blog. I'm not sure, but she may have some sterling silver. Beina: Of course! Your happy personality always makes me smile. It's sweet to read how much you care for your boyfriend. Satin and Souffles: First of all, I love saying your blog name! So fun! Thank you so much!! Nicole: I LOVE Melissa! One of her links on Friday made me laugh so hard I cried. You're so welcome! They're too amazing not to share! Thank you so much!! So glad you're here! Gorgeous fun and spunky rings!!!! :) The first ring is the prettiest one!! I love it!! Nicole: I couldn't agree more! That's totally the one I got! I. LOVE. it. Love it! !